Periodontal disease is the main cause of tooth loss in adults and so we take this very seriously at Southgate Dental Care. We have been accepting referrals from our dental colleagues since 1997 and treating advanced gum disease is a big part of what we do. Stavroula has been in practice limited to periodontics in London since 1995, and has been treating patients on referral here at the Southgate Referral Practice since 1997. After completing an MSc course in periodontology in 1994 at the University Hospital of Manchester she obtained an E.E.C.scholarship for further training and research at the Periodontolgy Department Hospital of Aarhus, Denmark, which is universally considered a Centre for Excellence in Periodontology. A wide range of non-surgical and surgical periodontal treatment is provided including regeneration procedures in order to replace the missing support of the periodontally compromised teeth. Stavroula Completed the Certificate in Dental Implantology at the Eastman Dental Institute in 2002, and is a member of the Hellenic and British Society of Periodontology and American Academy of Periodontology. 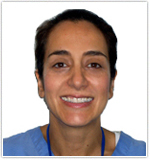 Haroula is a hygienist with many years of experience. She qualified with distinction in 1990 from the renowned Eastman Dental Hospital and was awarded the prestigious Eastman Nugent cup for gaining the highest marks in the final examinations for dental hygienists. Her main interests lie in treating advanced form of gum diseases, and she has worked in collaboration with periodontal specialists on many cases. Untreated gingivitis can advance to periodontitis and eventually lead to tooth loss and other health problems. Following are some of the procedures that periodontists use to treat patients diagnosed with a periodontal (gum) disease. A periodontist is a dentist who specializes in the prevention, diagnosis and treatment of periodontal disease. Periodontists receive extensive training in these areas, including three additional years of education beyond dental school. Periodontists are familiar with the latest techniques for diagnosing and treating periodontal disease. In addition, they can perform cosmetic periodontal procedures to help you achieve the smile you desire. AAP treatment guidelines stress that periodontal health should be achieved in the least invasive and most cost-effective manner. This is often accomplished through non-surgical periodontal treatment, including scaling and root planning (a careful cleaning of the root surfaces to remove plaque and calculus [tartar] from deep periodontal pockets and to smooth the tooth root to remove bacterial toxins), followed by adjunctive therapy such as local delivery antimicrobials and host modulation, as needed on a case-by-case basis. Your bone and gum tissue should fit snugly around your teeth. 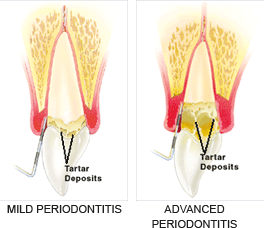 When you have periodontal disease, this supporting tissue and bone is destroyed, forming "pockets" around the teeth. Your bone and gum tissue should fit snugly around your teeth. When you have periodontal disease, this supporting tissue and bone is destroyed and pockets develop. Eventually, if too much bone is lost, the teeth will need to be extracted. Your periodontist may recommend a regenerative procedure when the bone supporting your teeth has been destroyed. These procedures can reverse some of the damage by regenerating lost bone and tissue. During this procedure, your periodontist folds back the gum tissue and removes the disease-causing bacteria. Membranes (filters), bone grafts or tissue-stimulating proteins can be used to encourage your body's natural ability to regenerate bone and tissue. There are many options to enhance support for your teeth and to restore your bone to a healthy level. Your periodontist will discuss your best options with you. Your teeth may actually be the proper lengths, but they're covered with too much gum tissue. A soft tissue graft can reduce further recession and bone loss. In some cases, it can cover exposed roots to protect them from decay. This may reduce tooth sensitivity and improve aesthetics of your smile. Whether you have a soft tissue graft to improve function or aesthetics, patients often receive the benefits of both: a beautiful new smile and improved periodontal health - your keys to smiling, eating and speaking with comfort and confidence. A healthy tooth. Plaque builds up ... ... gum and bone may begin to recede. Sometimes the gum recedes with the bone and sometimes it doesn't. Either way the tooth may become mobile. Q What is gum disease? A Gum disease describes swelling, soreness or infection of the tissues supporting the teeth. There are two main forms of gum disease: gingivitis and periodontal disease. A Gingivitis means inflammation of the gums. This is when the gums around the teeth become very red and swollen. Often the swollen gums bleed when they are brushed during cleaning. 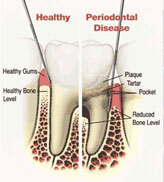 Q What is periodontal disease? Q Am I likely to suffer from gum disease? A Probably. Most people suffer from some form of gum disease, and it is the major cause of tooth loss in adults. However, the disease develops very slowly in most people, and it can be slowed down to a rate that should allow you to keep most of your teeth for life. Q What is the cause of gum disease? A All gum disease is caused by plaque. Plaque is a film of bacteria, which forms on the surface of the teeth and gums every day. Many of the bacteria in plaque are completely harmless, but there are some that have been shown to be the main cause of gum disease. To prevent and treat gum disease, you need to make sure you remove all the plaque from your teeth every day. This is done by brushing and flossing. Q What happens if gum disease is not treated? A Unfortunately, gum disease progresses painlessly on the whole so that you do notice the damage it is doing. However, the bacteria are sometimes more active and this makes your gums sore. This can lead to gum abscesses, and pus may ooze from around the teeth. Over a number of years, the bone supporting the teeth can be lost. If the disease is left untreated for a long time, treatment can become more difficult. A The first sign is blood on the toothbrush or in the rinsing water when you clean your teeth. Your gums may also bleed when you are eating, leaving a bad taste in your mouth. Your breath may also become unpleasant. Q What do I do if I think I have gum disease? A The first thing to do is visit your dentist for a thorough check-up of your teeth and gums. The dentist can measure the ‘cuff’ of gum around each tooth to see if there is any sign that periodontal disease has started. X-rays may also be needed to see the amount of bone that has been lost. This assessment is very important, so the correct treatment can be prescribed for you. Q What treatments are needed? A Your dentist will usually give your teeth a thorough clean. You’ll also be shown how to remove plaque successfully yourself, cleaning all surfaces of your teeth thoroughly and effectively. This may take a number of sessions with the dentist or hygienist. Q What else may be needed? A Once your teeth are clean, your dentist may decide to carry out further cleaning of the roots of the teeth, to make sure that the last pockets of bacteria are removed. Q Once I have had periodontal disease, can I get it again?